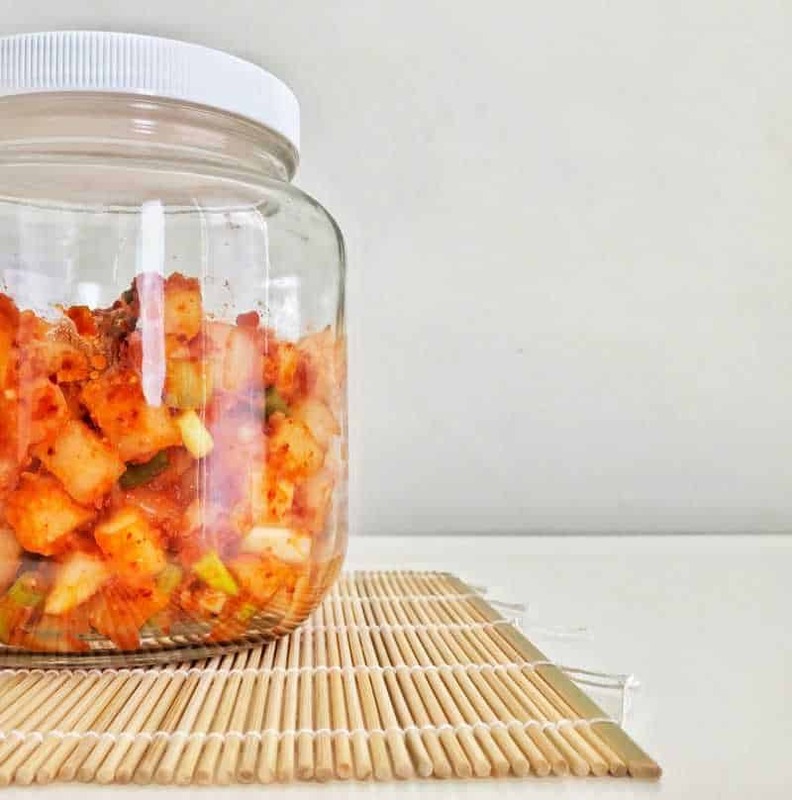 This spicy Korean Radish Kimchi is salty, crunchy, and oh-so-satisfying, with gut-healthy probiotics and ingredients that boost your metabolism! 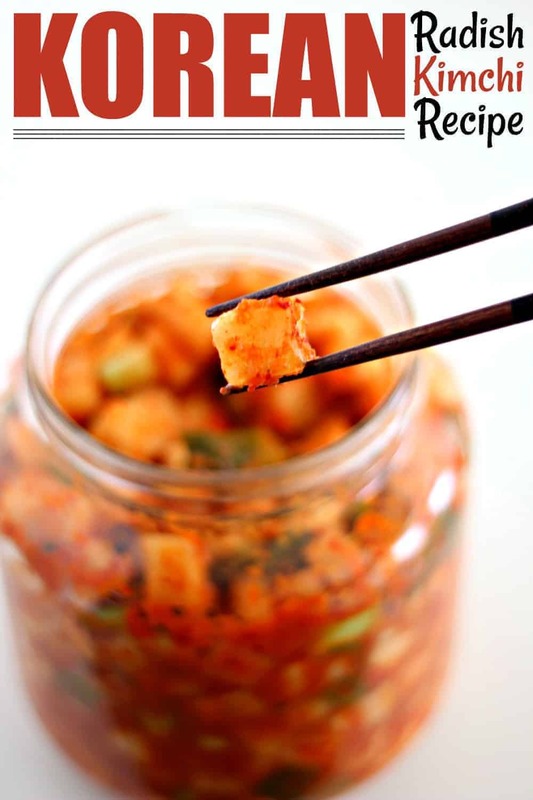 Find out how to make this simple kkakdugi kimchi yourself! 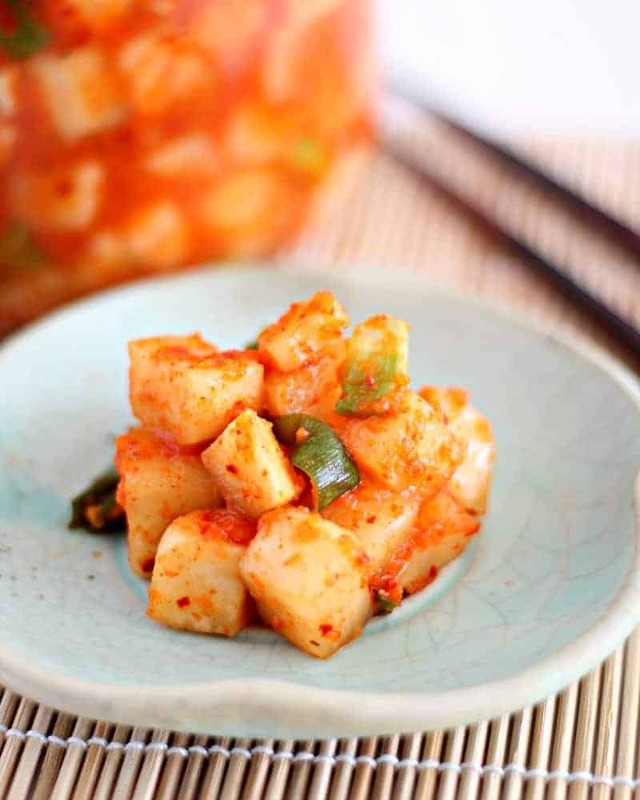 Also known in Korean as “kkakdugi”, this kimchi uses cubed daikon rather than the standard cabbage kimchi. This side dish, or banchan, is great served alongside fattier Asian meals, such as Spicy Korean Pork Belly. The most common is probably cabbage kimchi, which you can find at most Asian grocery stores. However, my very favorite kimchi is kkakdugi, the spicy radish kimchi, as it has more of a satisfying “crunch” than the cabbage variety. There are several variations of radish kimchi. Some variations use more sugar. Others incorporate shrimp. This was the recipe I used when I first started making kimchi, which I then changed up a bit to suit my taste. 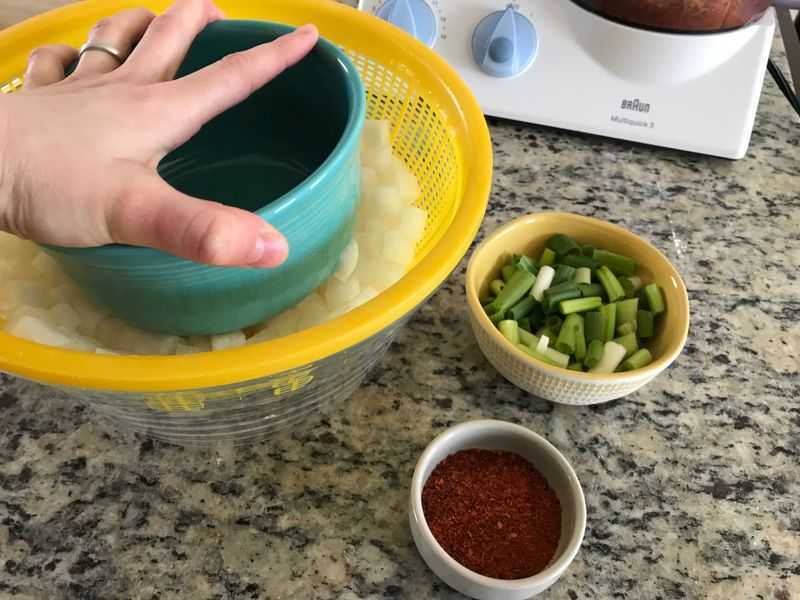 Because this is our family kimchi recipe, I have purposely made it a little milder and slightly less sweet…my whole family love this stuff, including my 3-year-old and 5-year-old! They actually beg for it when I have a jar in the fridge. I would have never guessed in million years that kimchi would be one of my kids favorite foods, but there you go! So the answer is, yes, kids absolutely can enjoy eating this radish kimchi! Even my kids who don’t like spicy food in gerneral gobble this stuff down! Because it is fermented, it contains bacteria and probiotics that aid in digestion and gut health. Purportedly, it also has such benefits as lowering cholesterol, helping one to lose weight, preventing certain cancers, etc. 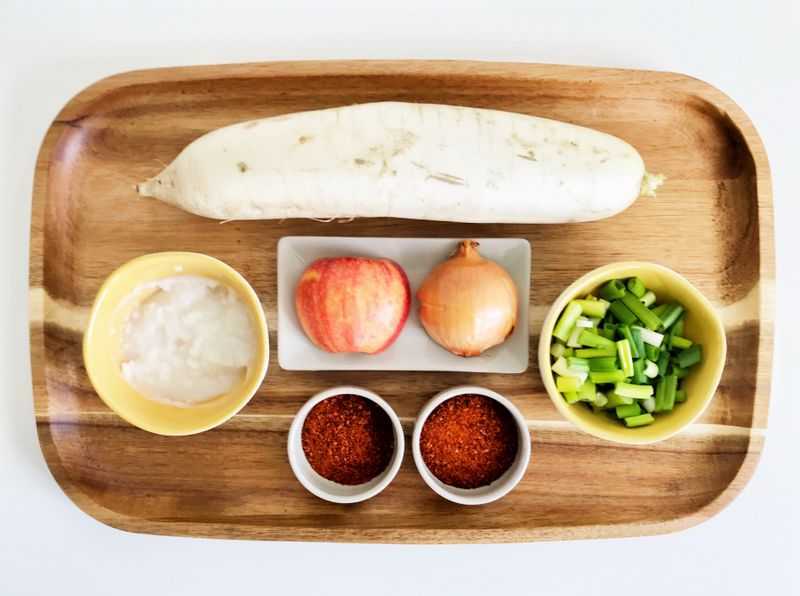 Here are the ingredients you need to make radish kimchi. When you are preparing the spicy kimchi base paste, you will first mix the rice flour into the water and microwave. After microwaving it will look like this. Start with the first stated amount of time on the microwave and increase in small increments until you get a gooey consistency. One key factor in making great radish kimchi is to make sure you get as much water out of the daikon as possible. Look how much water came out of my daikon from the salt soak! After the salt/sugar soak, you need to rinse the excess salt and sugar off of the daikon with cool water. You will still need to try and squeeze out as much water as possible out following that step. My trick is to place it in a colander over a deep mixing bowl and use another bowl to push down GENTLY to squeeze out the excess water. Gently is the key word here. I was still able to get quite a bit of water out of my daikon with this extra step. Also, you will notice that I had you separate the 4 Tbsp of gochugaru into 2 + 2 Tbsp. The first 2 Tbsp will be mixed into the spicy base paste and the second into the daikon itself. Now you are ready to make some awesome kimchi. 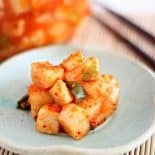 This spicy Korean Radish Kimchi Recipe (also known as kkakdugi) is salty, crunchy, and oh-so satisfying as a side or a quick snack. It also features gut-healthy probiotics and ingredients that boost your metabolism. 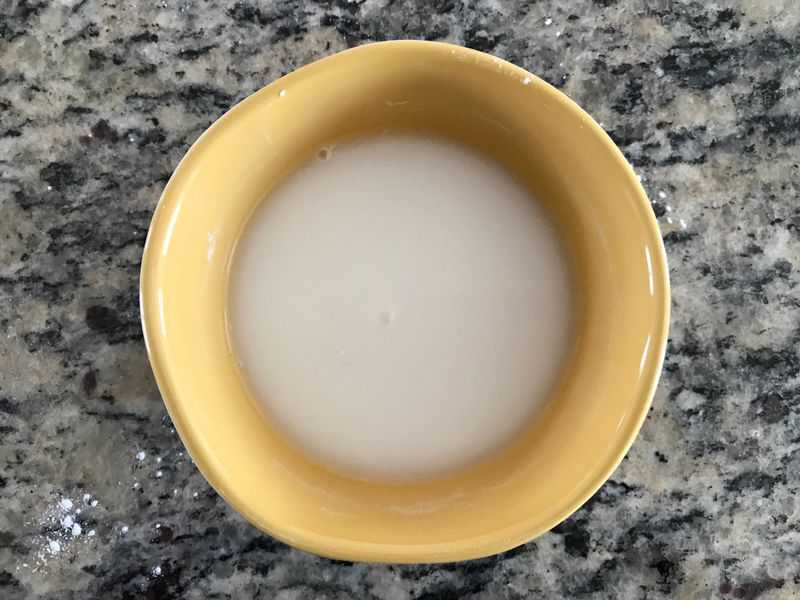 Mix the 1 Tbsp rice flour into the water and microwave for 1 minute. Remove and stir. If not solid, replace and microwave for another 30 seconds. Repeat until you have a semi-solid, gooey paste. Place aside to cool. Peel the daikon and cut off both ends. Cut the daikon into small cubes, about 1/2 by 1/2 inches. Place the cubed daikon in a large bowl. 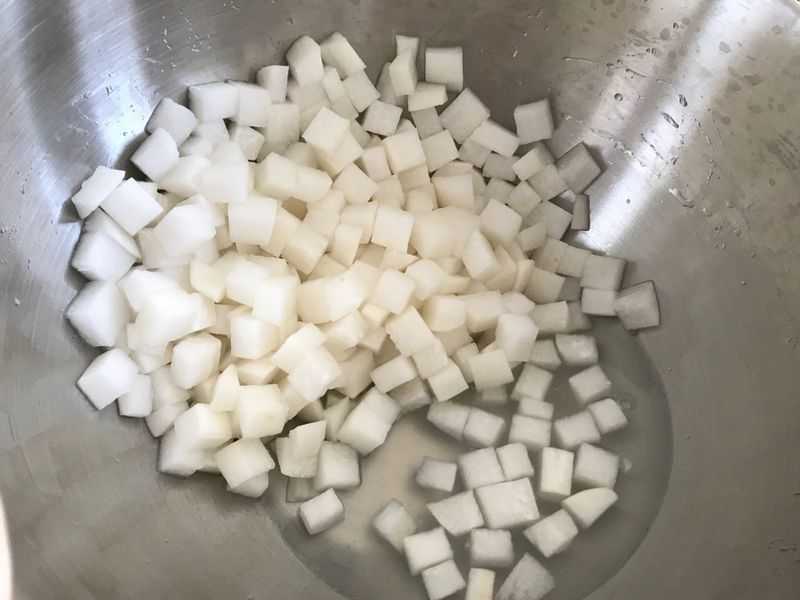 Mix the sugar and the salt together and add to the cubed daikon, stirring with your hands until combined and daikon is completely coated with the dry soak. Place the chopped onion, chopped red apple, garlic, and fish sauce in the food processor and blend at fast speed until pureed. 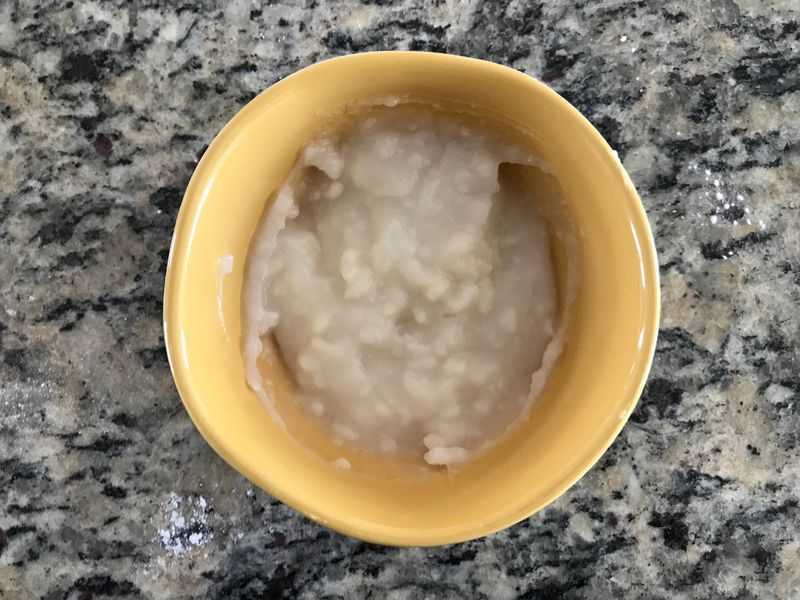 Add the rice paste mixture and 2 Tbsp of gochugaru to the food processor as well and blend on medium speed until all ingredients are combined. Set aside. Once 1 hour has passed, rinse the daikon under cool water until all the excess salt and sugar have been removed. Drain in a colander and repeat several times. 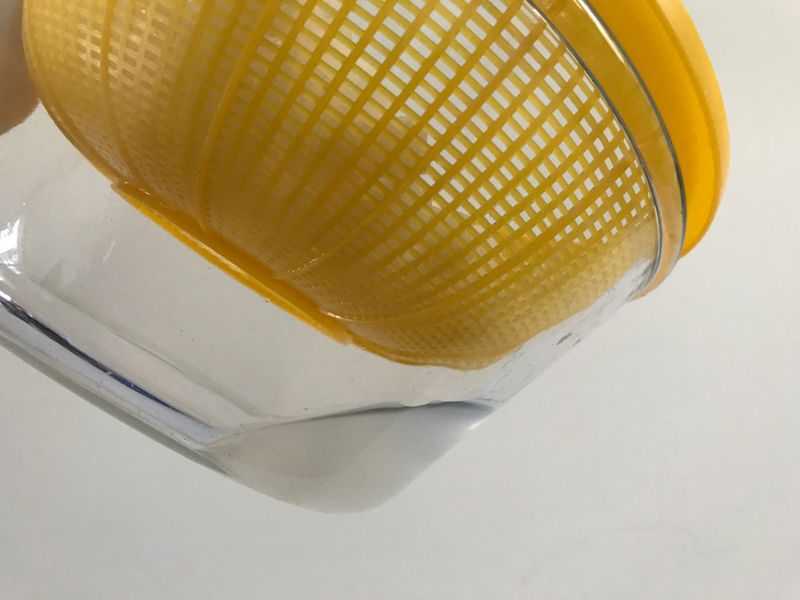 Place the colander over a mixing bowl so that it it suspended over it without touching the bottom. Taking a smaller bowl, gently press upon the daikon so that all excess water is squeezed out of the daikon. Move the bowl all around while pressing to get all the water out. Be careful not to crush the daikon. Leave to rest over the bowl to drain an additional 5 minutes. Place the cubed daikon in a different bowl and add the remaining 2 Tbsp of gochugaru. Mix with a gloved hand until the daikon is coated with the gochugaru. Add the green onions. Finally, add the spicy base paste and mix with your gloved hand until thoroughly combined. 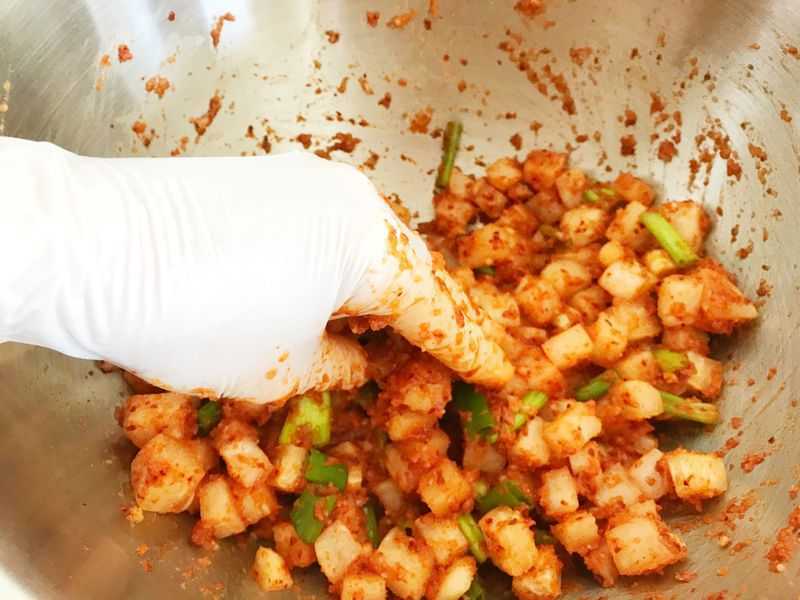 Place the kimchi in a large, airtight container on the counter at room temperature for approximately 6-12 hours. Then, place in the fridge. Wait at least 1 day for the fermentation to improve the flavor of the daikon and enjoy with your favorite meal. Best after 3+ days. Seanna, perfect! Nothing says “I love you” like a big jar of kimchi 😉 My husband loves this stuff too. I am a huge fan of kimchi! I can just eat it straight out of the jar like a salad. I will definitely have to try this out! Jacob, I know! I find myself putting it on/in everything…fried rice, ramen, anything! I hope you like it! My dad’s second wife came from Korea and she used to make cabbage kimchi and put it under the house to ferment. I do agree that kimchi is an acquired taste. My hubby loves it and we have a bottle in our fridge right now. Me, not so much…lol. Although, I’m sure anything homemade tastes 100% better than anything bought in the store. 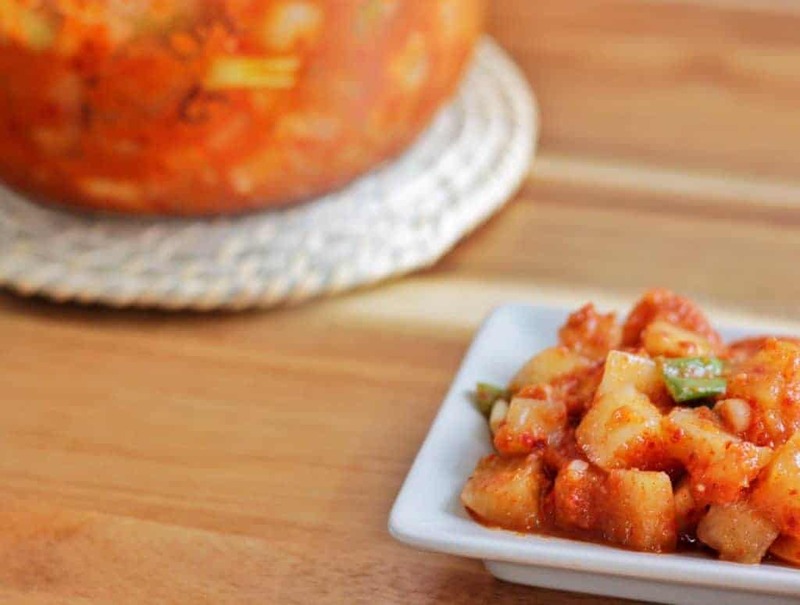 This is a great tutorial for making your Korean Radish Kimchi, I can’t wait to try it! So glad you could join us on Full Plate Thursday and thanks so much for sharing with us. Hope you have a great week and a very Happy Mothers Day! Wow that sounds amazing! Thanks for sharing with us at the To grandma’s house we go link party!